Mata Jayalakshmi taught Sri Swamiji Raja yoga and Sri Vidhya during His childhood . She would explain the esoteric meaning of the Vedas ,Purnas, Mahabharata and Ramayana. When Sri Swamiji was eleven years old Mata Jayalakshmi gave Him shakti pat initiation in the Anjaneya Temple. During the initiation Sri Swamiji experienced a vision of Mata Jayalakshmi in Her universal cosmic form as the Divine Mother. “His mother was now dressed in a green sari and she was bedecked in extraordinary gems and ornaments. She was seated on a golden throne decorated with nine different precious stones. At Jayalakshmi’s feet countless swans appearing in a subtle form began to gather. In his mind, Satyanarayana made circumambulation around the glowing feet of his Mother as he would for the Divine Mother. His spirit then merged with the swans taking refuge at her feet and he lost all sense of himself”. In all women see only me. Be compassionate to the meek and downtrodden. Whatever conditions or circumstances in which you find yourself, act only according to the scriptures. Save a righteous soul even at the risk of your own life. Give up discrimination. Consider all beings as one and the same. Whatever difficulty may arise, you should not set aside your routine practice. At the same time, it should never afflict others. However, it shall always be useful and do good to others. Behold me in all beings. Grow sharper and sharper in your knowledge of divine wisdom so you may make it easy and attractive in its form and style to the mass mind. Never openly proclaim what your future incarnations will be. Undertake the task of propagating dharma and virtue. This, too, should be done in an easy style as is feasible. It doesn’t matter if you suffer, but lead your life in such a manner that it won’t cause any inconvenience or suffering to others. 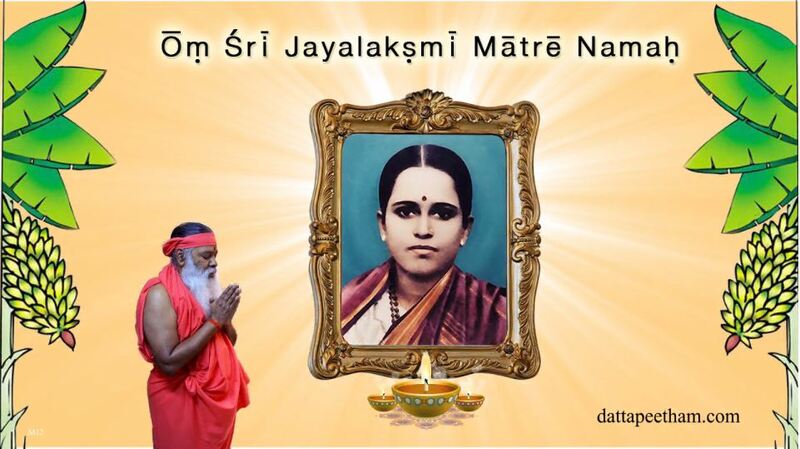 Shortly after initiating Sri Swamiji, Mata Jayalakshmi attained Mahasamadhi on Shankara Jayanthi in 1953.